Although I am not really the kind of person to play practical jokes on other people, I will admit that, to an extent, I do like messing with people’s minds. Looking back through the haze of time, I think that some of the best artwork I ever did, in the mid 1970’s, before I began to focus on comics as a means of creative self-expression, played with people’s perceptions of reality. In a sense, it could have been written in some art magazine (although it wasn’t), that my artwork in those days challenged viewers to not just look at my work but to think about it. I began with the perhaps erroneous assumption that human beings have an innate desire to make sense out of the world, to understand what they are experiencing. For years, I had created these three-dimensional concoctions or “assembledges” as I called them, by selecting, then carefully modifying ordinary or found objects and combining them or incorporating them with others into a new context. This essentially constitued my artwork in those long-lost days. Today, as I was on my way home from getting the oil changed in the station wagon, I decided to stop into the grocery store for a few items. A few minutes later, as I was walking back to my car through the large parking lot and reaching into my pocket for my car keys, I noticed my wife’s car, a blue VW beetle, parked on the other side of the parking lot. Apparently, she had decided to go shopping as well, and since the store is large, somehow, we had missed each other. As I was getting ready to push the button on the key ring that unlocks the door of my station wagon, I realized I had the extra set of keys to the VW in my hand. Walking over to her car, I unlocked it, got in, started the engine, and drove it about ten feet to an adjacent parking spot and in the process, turned it around and faced it in the opposite direction. “Won’t she be surprised and maybe a little intrigued when she comes out and the car is in a different spot?”, I mused. Then I got out, went back to my car and drove it to another parking spot some distance away and sat there waiting for her to come out of the store with a shopping cart full of groceries, so that I could surrepticiously observe her befuddlement upon discovering that her car was not where she left it but in another spot. After a considerable time had passed and she still had not appeared on the scene, I decided to go home and wait for her there. As I was pulling into the driveway at home, I suddenly remembered that my father had once played a joke on my mother. I wondered if there is a genetic component to joking. They had been married for two or three years when the event which I will endeavor to describe ocurred. It was during World War Two, in the days in which most people still traveled by rail. 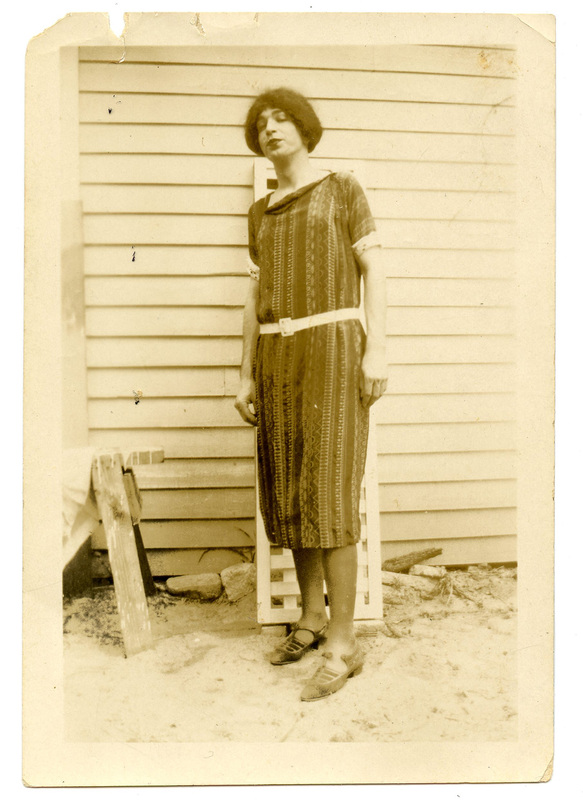 My mother, who was around 24 at the time, had made plans to leave Savannah on the overnight train to visit her older sister in New York City for a week. She got all dressed up, put on a big hat with a wide brim and a feather in it and my father drove her to the Union Station Railroad Passenger Terminal in Savannah. People dressed well in those days when they were traveling. My father helped her on board and then went back outside onto the platform and, ever the dutiful husband, waved at her and blew her a kiss as she sat in her seat looking out the window at him as the train pulled slowly out of the station. Then my father hopped back in his car and drove to the airport and flew to New York City and stayed overnight at a hotel. The next morning when my mother’s train pulled into the Old Pennsylvania Station my mother’s older sister was there to meet her. Accompanying my aunt was a strange woman in a long dark blue dress and high heels and stockings and wearing lipstick and a big floppy hat with a mourning veil in front. That woman was my father. “Hello, Bill….” said my mother, having recognized him almost immediately through tired eyes which had opened and closed many times throughout the night as she sat in her seat in coach, trying to sleep or looking out the window at dark little farmhouses passing in the countryside each with a yellow light on in the window, or watching wearily as men and women, strangers in heavy coats, with suitcases and unidentified things in bundles got on and off the train, and brushed by her seat in the middle of the night and early hours of the morning in places like Charlotte, Raliegh, and Washington, D.C.
My mother was not the type to be easily amused and was not amused then. But she was not my mother then. If anyone ever came close to amusing her it was probably me. Oh–! What was my wife’s reaction?, you may be wondering. “Did you play a trick on me?” she wanted to know as she pulled into our driveway and proceeded to unload a carload of groceries. She said she had purposely parked the car near where the shopping carts are stored but then when she was returning the cart, it seemed further away and made her question her own sanity. Maybe every now and then we should all be made to question our own sanity. Perhaps facilitating the process of people questioning their own sanity is my little gift to the world.